Boxe-Française Savate is a unique ring fighting art that fuses French kicking with English boxing. It is an agile modern sport that is practised by men and women of all ages around the world. Savate has roots in the 1800s, combining the Southern-French kicks of Chausson, with Savate (meaning old boot) from Parisian street fighting. Charles Lecour formalised the art of Boxe-Française Savate in 1838 after reputedly being beaten by an English boxer. 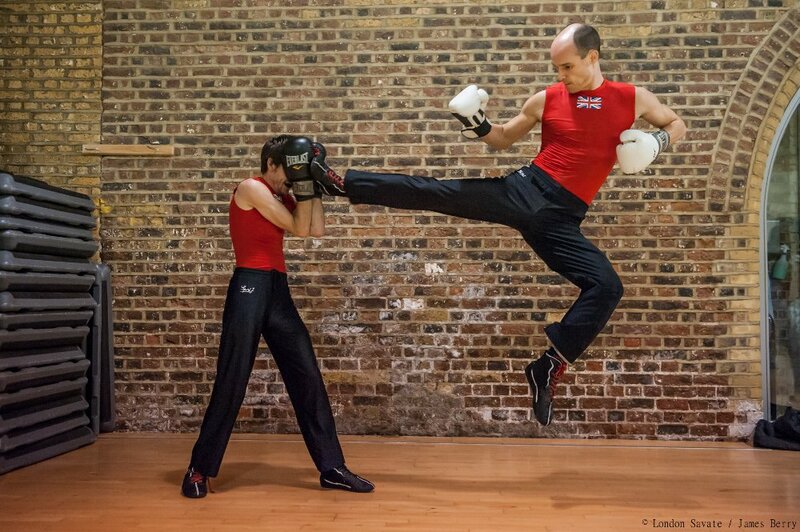 Savate uses angles and strikes that are typically not found in Thai boxing, kickboxing or MMA. Bruce Lee used studies in Savate when writing about Jeet Kune Do. Grading awards in Savate are called ‘gloves’. The progression is a clever way of learning to spar with composure and understanding. This is what we teach. Blue Glove I touch without being touched in reply. Green Glove I avoid being touched and touch in reply. Red Glove I avoid being touched and reply on a different line. White Glove I touch before I am touched. Yellow Glove I create an opportunity to touch. Silver Glove I have mastery of all phases. Assaut – fighters score points with touches, all force excluded. Combat – full contact is used to win by KO. Canne de Combat is a stick-fighting art. Savate Defense is the self-defence side of Savate. Savate Forme is a workout to music.